Can you feel that? That’s the feeling of flannel on your skin for the first time in eight months. It’s the feeling of actually being cold in a place that isn’t air-conditioned. Can you hear that? It’s the sound of leaves crunching under your feet, quiet homes as children go return to school, and chili bubbling on the stove. And can you smell that? It’s the scent of pumpkin spiced lattes wafting out of every coffee shop, freshly baked pies sitting in window sills, and fireplaces billowing smoke out of chimneys. In other words, IT’S FALL Y’ALL! Many people have a fascination with fall, especially after a long, hot summer. And as a CSA farmer or fresh produce deliverer, you have the ability to capitalize on this fascination by offering special goods during autumn. While it may sound complicated to add a bunch of seasonal inventory to your home produce delivery website, it can actually be quite easy if you are using the right meal delivery software. At Delivery Biz Pro, we think we are that ‘right meal delivery software.’ We help local farmers deliver to hundreds of thousands of customers every week with easy-to-use routing and delivery software. But we don’t want to just see your business optimize its deliveries and routing. We want to see it thrive and try new things without the fear of it being ‘too complicated.’ At the end of the day, nothing is too complicated with just a little bit of planning and a good software. We know fall is a busy time of year for your farm, and you are likely overflowing with seasonal produce. That’s why in today’s blog, we want to give you some ideas about what to do with all of those pumpkins and pears that are taking over your land. Keep reading to get some fall inspiration! First, let people know what they can get and when. If you use a CSA software or meal delivery software, it is likely that your customers expect a shipment of produce or meals every week or once a month. Perhaps they’ve been working with you for so long that they trust your judgement and don’t even hop into their accounts to choose what should be delivered. They might not even think to get their pumpkins from their CSA farmer! So be sure to let them know when you have new seasonal products in stock. With Delivery Biz Pro, we make it easy to send out mass communication to your customers. For example, you can send out an email to all of your customers with an enticing subject line like, “Don’t Miss Out On Our Special Fall Offerings!” In the body of the email, let them know what products you’ll be offering for fall and how they can get them. We also make it super easy to add seasonal products to your inventory and track sales and stock for these specific products. If you only want to keep the order window open for four weeks or until the inventory is sold out, you can do that all by checking a few boxes. Get creative with what you’re offering. 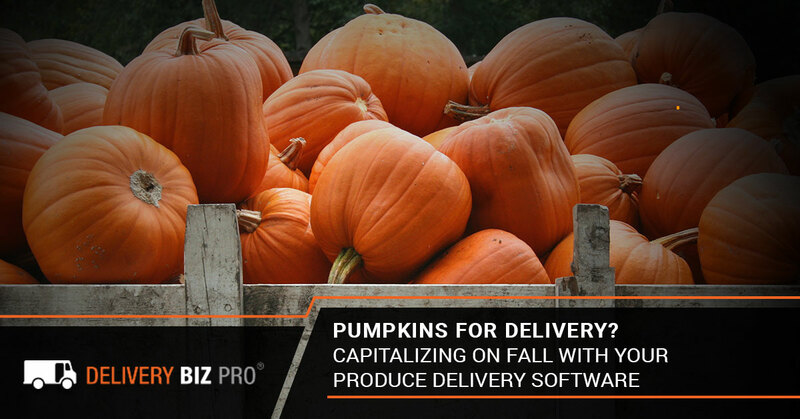 As you can see by the title of this blog, one option is to offer pumpkins for delivery. While people can cook with these, they can also carve them into Jack O’Lanterns with their kiddos. And if you’re thinking, “Families want to go to the pumpkin patch together, they’ll never opt for delivery pumpkins,” have you ever hauled a bunch of kids to a pumpkin patch? The first time it’s a great opportunity for photos. The second time it’s full of crying because they don’t like the you-can-only-get-a-pumpkin-you-can-carry-yourself rule. The third time you wonder if you accidentally wandered into a haunted corn maze because this is truly what nightmares are made of. We’re kidding, of course. Or, are we? We’ll never tell. The point is that there are likely multiple families on your subscription list who would gladly forego the pumpkin patch this year. But why stop at pumpkin deliveries? If you run a meal delivery service, for example, you can offer a special ‘dessert kit delivery’, where you prepare a package with everything your customer needs to make a pumpkin pie from scratch! Include a fall-themed recipe card, a pumpkin they can actually cook and puree themselves, a couple of eggs, evaporated milk, and all the spices they need to create fresh pumpkin pie. You can even include flour and butter so they can create their own crust from scratch as well. Pro tip: be sure to also include directions on roasting all those pumpkin seeds! If you have plenty of apples to spare, you can create the same type of kit but for an apple pie. Your customers will love that they can use farm-fresh food to create a meal from scratch without having to run to the store for all of the ingredients. You can also begin to offer fall-themed dinners and meal kits. Pork chops and cinnamon-spiced apple sauce is always a hit. But you can go even more autumnal by offering pumpkin soups and stews, pumpkin chili, pumpkin pasta dishes and so much more! Butternut squash also makes a great pumpkin alternative for fall-worthy dinners. If you don’t have the resources to offer full fall-based meals or it isn’t part of your business model to create meal kits (many CSA’s simply offer a boxed share of that week’s produce, for example), you can still offer some tasty fall treats that your customers can add to their delivery! Some seasonal options you can easily offer using your produce delivery software include homemade pumpkin butter, apple butter, pear butter, applesauce, pumpkin bread, fig spread, and cranberry sauce. The list could go on and on, but isn’t your mouth watering already just thinking about these? Well, your customers’ mouths will water too when they visit your website and see a big display advertising these seasonal treats and how easy it is to have them delivered to their home! As your preferred produce delivery and routing software, we make it easy for you and your customers. On your end, you can customize your offerings, add seasonal produce and treats, send out mass emails to your customers to advertise your new products, and control your inventory management to prevent selling more than you can provide. For your customers, they can receive beautifully designed email reminders about upcoming seasonal offerings, add special products to their carts for the next delivery, and see when a product is out of stock. There are a lot of neat things you can do this fall with your produce delivery service, and we want to make it as easy as possible. Let us handle the software and routing side of things while you focus on bringing your clients fresh, local products they’ll love! To learn more about all that Delivery Biz Pro can offer, just drop us a line! We’ll set up a time to discuss our delivery routing software and see if we’d be a right fit for your CSA, local farm, or meal kit delivery business. We look forward to hearing from you!